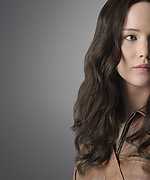 Read the article about Jennifer Lawrence on Becoming the Mockingjay from The Hunger Games Exclusive. Fight or flight? It?s our primal response to a threat. Blood pressure soars. Muscles tense. For Katniss Everdeen, this physiological assault is an ongoing state of being. 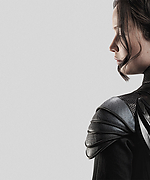 Will she rebel against the Capitol or run? ?At this point, does she really have a choice?? asks Jennifer Lawrence. ?It?s not just about saving the people she loves now.? At the moment, Lawrence is filming a scene from Mockingjay?Part 1 in which Katniss collides head on with the very reality she instigated when she destroyed the arena. On location in Atlanta, a jagged ruin has replaced the bombed-out District 12. Her house still stands only to taunt her of what might have been. Cameras roll, as she surveys the broken glass and domestic shrapnel in the deserted kitchen. In a span of seconds, the actress shows disbelief, regret, and then anger?almost every stage of grief but acceptance. When someone yells, ?Cut!? Lawrence sheds the emotions as easily as a cardigan. 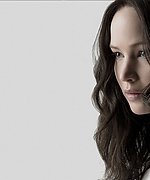 ?Jennifer captures the strength in silence, which is a big part of Katniss,? says director Francis Lawrence. Offscreen is a different story. The Oscar-winning actress couldn?t be more talkative. During a break from shooting, she sat down to chat about the exciting evolution of her character. Katniss must feel like an alter ego at this point. 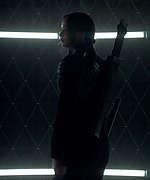 Actually I am nothing like her, but Katniss is a dream character. She is the reluctant hero. She is constantly evolving and changing, so even though I play her in four movies, I never get bored. In Mockingjay?Part 1, she has had so many loved ones ripped away from her and she is feeling so much. How do you play someone who has endured so much strife? I don?t know. Maybe it comes from empathy or imagining what that must feel like. But you can only genuinely feel it for a few takes and then it becomes about remembering and repetition. What aspects of your own personality do you bring to the character? I don?t really feel like there is a lot of myself in Katniss. I wish that I could be somber and serious and brave like her. What do you love about the Mockingjay set? Josh and Liam are my best friends. And we?ve got the best crew that we?ve known for years. I don?t have to be ?on? all the time in front of them because they feel like my family. Speaking of Josh, Peeta is confined in the Capitol in Mockingjay?Part 1. Oh, it was awful. Those were the dark days. Josh and I have never done that before?been apart like that. During the other movies, we saw each other every day. 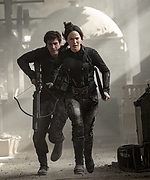 Now, it?s just Katniss and Gale. How does your relationship play out with Peeta gone? It negatively affects their relationship because Katniss can?t move on from Peeta or forget that he is being tortured in the Capitol. So they?re both haunted by this ghost. 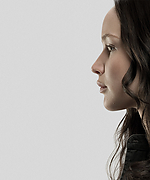 It?s like how it used to be [in District 12], but she and Gale are in a completely different world. They have to get used to District 13 and it?s bleak. You have some new cast in MJ-1 too, like Natalie Dormer as Cressida and Julianne Moore as Coin. Girls! Yay! It?s such a boys? club, so I love that Julianne and Natalie came on. They?re both so fun to work with and it?s just nice to have some more women in powerful roles. 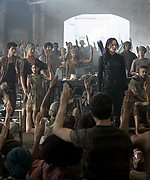 With Cressida and her crew, Katniss sees people who have dedicated their lives to the cause. They escaped the Capitol for this rebellion and they gain her trust. Katniss and Coin have an interesting relationship because they have very similar ideas of how the world should be, but different ideas of how to get there. I think that?s a common issue for people too. What are the means to the end? In the book Mockingjay, we see Panem strictly through the eyes of Katniss. How does that translate onscreen? The books are narratives, so everything comes from Katniss? perspective. What I love about this movie is that you see Snow?s build-up and mine separately. I think fans are going to be so excited to get to see what?s actually happening in the Capitol. Mockingjay is the most intense book of the series. What is your take on it? 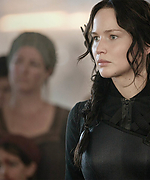 The first two books take place in the arenas and Katniss is collaborating with the government to survive. But in the third book, everything culminates into something bigger, a revolution. You see just how powerful one voice can be. Cinna?s Mockingjay costume is a whole new look for Katniss. I love that it?s scary and very intense but feminine and pretty at the same time. It?s not the most comfortable costume in the world, but it?s utilitarian. I like clothes that let you to get the job done. When the shoot wraps, what will you take from the set as a keepsake? The bow! Our props master told me that he could get me a new one because they made a few of them, but I want the one that Katniss is using while we shoot. It?s all scratched up. That bow means a lot to me.